MAARTEN (OR MR. ) MAARTENS was born in Gryskerk in the Netherlands about 1654 and got married in Drakenstein about 1671. His spouse’s maiden name is not known. They had a daughter, JOHANNA, who was born in 1675. She was married twice, first to Johannes Oosthuizen in Drakenstein on abt. 1698 and after his death in 1730 she married Andreas Duyf. ANTON MAARTENS came van Celle, Hannover, Germany. He was born c. 1687. He was the son of Jasper Martens en Anna van Deventer. Arrived at the Cape of Good Hope as soldier for the VOC (Vereenigde Oost Indishe Compagnie) in 1710. In 1712 he leaves the employ of the VOC and becomes a Burgher. He worked as a shoemaker in Cape Town working for Basilius Kretzschmar. On the 6 August 1715 he married SARA CLAASEN MOLLER, daughter of Johan Claus Moller of Hamburg. On the 15 Dec 1720 he got remarried to HERMINA HERWIG of Amsterdam (widow of his boss, Basilius Kretzschmar). Anton died in c.1725. His legacy of the Maartens name would be continued through his sons ANTONIE AND JASPER. Although listed in “Names of German Immigrants 1652 – 1805”, nothing more is known about him. LOURENS MAARTENS was born abt. 1709 in Christiania, Oslo in Norway. On or about the 11th of February 1739 he married MARTHA VISSER in Stellenbosch, Cape Of Good Hope. From the available sources it would appear that she is the same MARTHA VISSER who was married to DIRK MAARTENS. The timeline supports the theory but proof is still to be provided. Proof of this is moot though, as they had three daughters and thus the MAARTENS name of this line would not be continued. ERNST MAARTENS came from Hartenberg, a village in Bavaria, Germany. Although listed in “Names of German Immigrants 1652 – 1805”, nothing more is known about him. JOACHIM HEINRICH MARTENS is the Patriarch who is the primary focus of our research. His date of birth has not been established with supportive proof yet, neither is the exact location of his origins. To date the date of birth is given as somewhere between 1729 and 1733 which would make him a boy/man of between 14 and 20 years old when he came to the Cape of Good Hope in 1747. 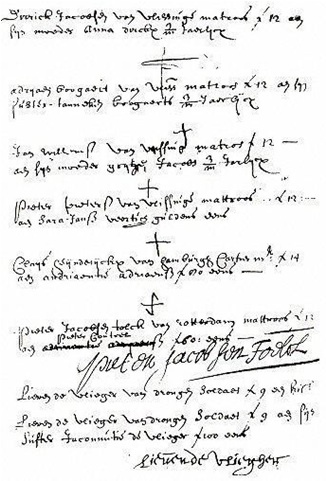 The following document is a copy of his records from the VOC archives held at Den Haag in the Netherlands. 1. His name is depicted as “Jochem Martens”. Thus the “Heinrich/Hinrich” became “Hendrik”. 2. He is from the State of Brandenburg in Germany. Refer to the tab marked “Interesting Background Information” for details of Brandenburg in the 18th century. Suffice it to say that Brandenburg was divided into three main areas or “Marks or Marshes”respectively, namely the Altmark (the Old Marsh) to the East, the Nieumark (or New Marsh) to the West and the Mittelmark (or Middle Marsh) in-between. So, for the time being, we have interpreted the word “Oldenmark” as being in the Altmark region of Brandenburg. The town called “Matsdorp”, however, is providing us with some concerns. The German translation for Matsdorp would be “Matzdorf”. There is such a town, however it lies to the West of Brandenburg and is in the Nieumark. The only town bearing a resemblance is a town called Messdorf in the Altmark and part of the town of Bismarc near Stendal today. Watch this space for further developments! 3.He was recruited by an agent called P Meyerwho would have been responsible for getting him to Amsterdam, lodging him and kitting him out for the voyage. Upon signing up and making his cross (if he could not write) he would have received the equivalent of two months salary at 9 Riyksdaalers per month. The agent received the sum of Rds.150 for the contract and spent a further Rds. 4.50 on his kit leaving him owing the VOC the sum of Rds. 172.50. These agents were called “sielsverkopers” (sellers of souls) by many as the money would be paid over to the agent by the VOC and recovered from the recruit over time until the debt was fully paid. The following illustration depicts a typical agent’s list of recruits complete with their crosses. Note that the crosses really were crosses, rather than the “X” that we have become used to. 4. He was hospitalized upon his arrival at the Cape of Good Hope (and had to pay for his treatment). The journey from the Netherlands took around three months by sea in an East Indiaman and was extremely hazardous. Chances were pretty good that the sailors would be suffering from scurvy or any one of a number of dietary diseases or injuries. 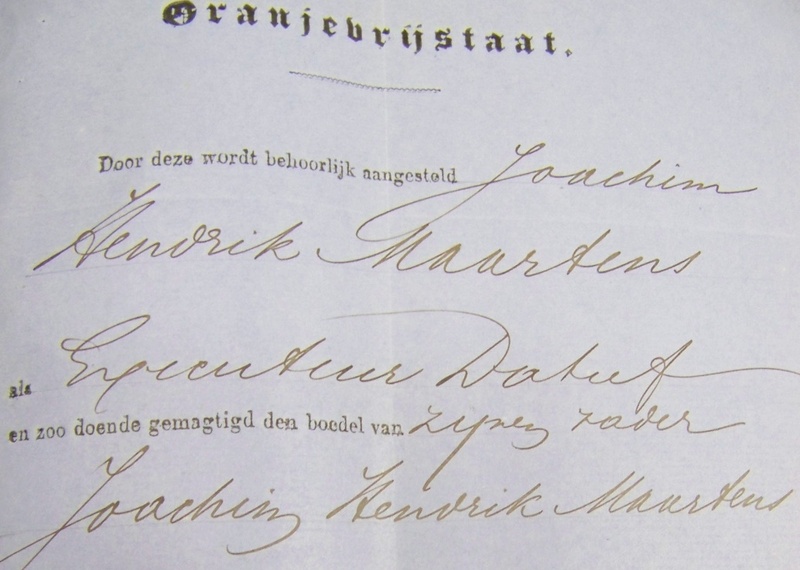 From TANIP, the VOC resource files on the internet we have learnt that Joachim came over on a ship called the KASTEEL VAN TILBURG, captained by Captain Abraham Zwart. They departed from Texel near Amsterdam on the 2nd of May 1747 with 254 souls onboard. [129 seafarers, 115 soldiers, 2 craftsmen and 8 passengers]. Conditions on board the VOC ships of that era were not conducive to good health and in the 10 years 1740 to 1750 the average number of deaths on these journeys was around 13%. The Kasteel van Tilburg arrived at Kaap de Goede Hoop on the 22nd of August for replenishment after her journey of nearly 4 months and before her departure onwards to Batavia and the world of spice. Heinrich Joachim Martens was one of the 115 “soldiers” on board, of which 35 would remain at the Cape of Good Hope together with 5 of the passengers. Although he was denoted “soldier”, it was common for all VOC employees without an appointment to carry that title. Thus even a doctor would have been denoted as a soldier until such time as he received his letter of appointment. On the 12th of September, re-equipped with fresh food, water and some additional crew, the Kasteel van Tilburg departed for the final part of her journey to Batavia which she would not reach until the 2nd of December. When Heinrich Joachim stepped off the ship 6 sailors had died and a further 26 were landed because of disease. 5. The dates on the lower right hand side are from 1756 to 1774. We know that Joachim became a Burgher in 1756.
cont. [continueert] zodanig onder ult. [ultimo – laaste dag] Aug. 1756 vide [sien] Caaps Vryboek 1756 fo. [folio] 88 dito dito dito 1757 dito dito 1757 fo. 87. In the first case there is reference to folio 103 of the incoming documentrs from the Cape where his Vryburger contract would be. In the second and third cases reference is made to folio 88 of the Cape Vryboek of 1756 and folio 87 of the Kaapse Vryboek of 1757. Expl. "Die Kaapse vryboek is ‘n Grootboek en Joernaal met alle lopende rekeninge wat vryburgers by die kompanie vir die jaar gehad het. Elke jaar word ‘n nuwe ‘Vrboek’ aangemaak en aan die einde van die jaar (finansiële jaar) word dit opgestuur na Nederland. 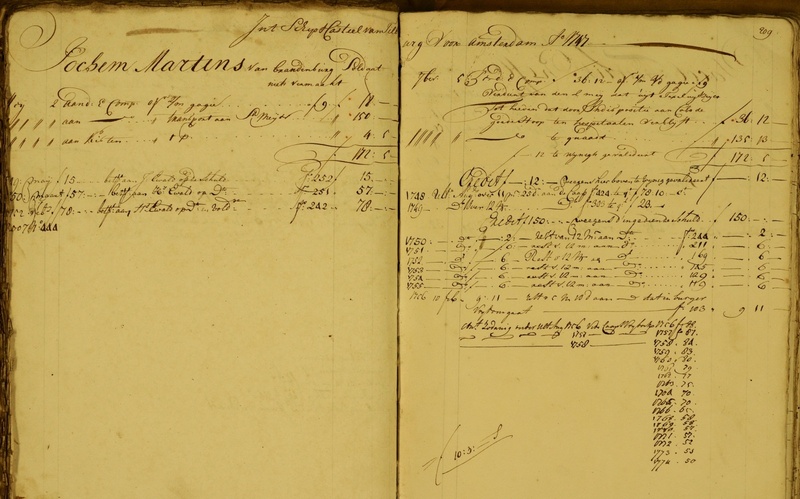 What we can derive from these entries is that Jochem Martens had an acount, and thus debt with the VOC from 1756 t/m 1774 ‘with the exception of 1767. So he regularly bought on acount with the VOC like many other Vryburghers. Each Burgher in the Cape had to file an “opgaaf” for the "kwartaalstate" annually giving account not only of the members in his household but also of all his possessions for taxation purposes. As the last opgaaf was made in 1774 it must be assumed that he died between 1774 and 1775. An examination of the actual kwartaalstate in the Cape Town Archives also indicate that he did not own any cattle or ground, that was taxable, for the entire period. 2nd of May 1747 – The Kasteel van Tilburg departs from Texel. 22nd August 1747 – The Kasteel van Tilburg arrives in the Cape of Good Hope. 1748 to 1750 he is employed as a stable hand. 1750 and 1751 he is employed as a soldier doing duty at Klapmutz..
1752 to 1756 he is again employed as a stable hand. 1756 – Joachim becomes a (Free) Burgher and start to practise his trade as carpenter in Stellenbosch. 5 August 1759 – Joachim marries the 23-year old Jacomina van den Berg in the church in Tulbach…the same church that stands there today. Jacomina was born on the 6th of October 1736 and baptised on the 6th of October 1737. She was the 5th child of Jacobus van den Berg (First Generation Van Den Berg), a wealthy farmer who farmed on “de Groot Eijlant gelegen an de Smalblaar refier (river)’. Groot Eiland was one of the old Goudini farms. Goudina ""De Goudene Dina") only came to being in 1858 but was used for cattle grazing since 1716. Today the Groot Eiland is a well-known wine cellar, but a fraction of its former glory. Abt. 1760 – The eldest son, JACOBUS MAARTENS, is born and baptised in the church at Tulbach on the 21st of September 1760. The Patriarch’s wife JACOMINA had a younger sister, the youngest of the van den Berg children called MARIA MAGDALENA VAN DEN BERG who was married three times, one of the marriages being to JOSUA JOUBERT (second generation Joubert) , also from one of the prominent families of the Cape. One of their children was a girl, MARIA MAGDALENA JOUBERT. Jacobus married her on the 18th of November 1787 and so becomes the first Martens to marry a cousin. Jacobus is the first of the three Martens branches that our research follows. Abt. 1763 – The second child Anna Margaretha Martens is born. She is also baptised in the church at Tulbach on the 6th of November. Abt. 1765 – Anna Margaretha dies, aged two. There was a second outbreak of smallpox in that year and it may well be that that is what caused her death. And upon such vagaries are generations altered and the future changed!! 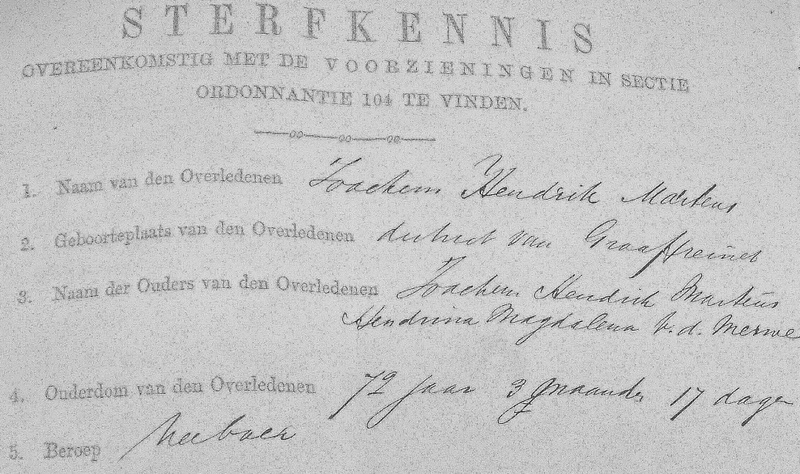 On the 13th of August 1786 JOACHIM HENDRIK MARTENS marries HENDRIENA MAGDALENA VAN DER MERWE, daughter of Dawid Schalk van der Merwe (married to Anna Maria Pretorius). Dawid Schalk was a prominent man in the Camdeboo being both “Veldwagmeester” and Heemraad of Graaf-Reinet. Abt. 1770 – JACOMINA MARTENS dies in Stellenbosch/Drakenstein. Abt. 1774 – Joachim Heinrich (Hendrik) dies. Circumstances unknown. JOHANN MARTENS came from Rostok in Germany that today is part of Hlavni mesto Praha in the Czech Republic. Although listed in “Names of German Immigrants 1652 – 1805”, nothing more is known about him. Carl Philipp Martens was born in Cele in Germany that today is in the Republika Srpska, Bosnia and Herzegovina. Although listed in “Names of German Immigrants 1652 – 1805”, nothing more is known about him.